We have just come back from Pulau Redang, it was a fantastic trip! 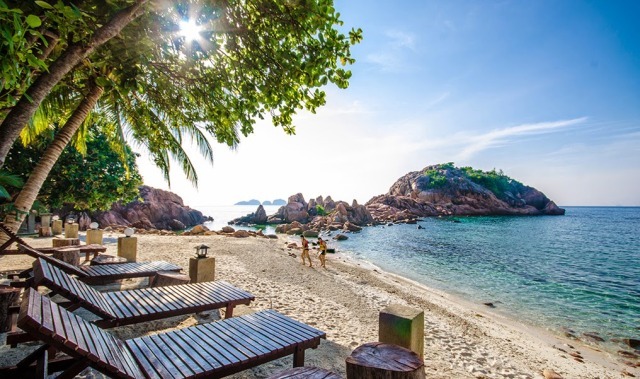 Actually there are quite a number of resorts in Pulau Redang with plenty of reviews available from various online sources (such as tripadvisor, agoda, booking.com, trip reports and etc). After comparing the price and reading the reviews, we decided to book with Redang Pelangi Resort. After comparison, we found that most of Redang packages are about the same in term of itinerary although the packages are provided by different resorts, however, you will see significant price difference. A 3 days 2 nights Redang package will normally includes 3 meals per day, tea break, free flow beverages and snacks, 3 snorkeling trips (inclusive of 1 trip to Marine Park), jetty transfer from Merang jetty to Redang. Snorkeling gears are normally excluded and you will need to rent it from the resort dive centre which will cost you not more than RM20 per set. For a hassle free trip, you may also request the resort to arrange for land transfer from Kuala Terengganu Airport/city to the jetty. This will cost you between RM25-30 for a return trip. Our package cost us RM440 per person, inclusive all of the above mentioned. We booked the package during Matta fair with Redang Pelangi Resort directly, so we got free land transfer, snorkeling gears and life jacket, saved RM45! We booked our flight to Kuala Terengganu from LCCT with AirAsia during free seat promotion, return flights only cost us RM45, we only paid for the airport tax and fuel charges, this is definitely a great deal! In fact, there are quite a lot of flight promotions throughout the year, especially by AirAsia. Lets take another example, our friends managed to book another tickets to Kuala Terengganu for only RM58 this year. After completed the booking for air transfer, now, it is time to think about the transport arrangement from Kuala Terengganu to Redang Island. Most of the ferry transfer arranged by resorts departs at around 8am to 9am daily, but our arrival time to Kuala Terengganu is scheduled at 12pm. After discussion with our friends, we decided to stay a night in Kuala Terengganu town, this way, we do not need to pay for the ferry transfer on our own which will cost us RM50. From Kuala Terengganu airport, the taxi fare to Kuala Terengganu town costs us RM25, the journey takes about 15 minutes. It is not expensive in our opinion. So, it is good to take this transportation guide in mind to avoid timing mismatch. For island or beach holiday, it is better to carry all the necessary personal items with you, otherwise, you will either get these items at a very high price in the resort or don’t find it at all. – Sun block is a must. – Sun glass, hat and swimming suites. – Conditioner or lotion for application after snorkeling. – The backdrop of the resort is rainforest, so it is also good to bring mosquito repeller. – Some rooms in the resort do not equipped with TV, a book, MP3 player and tablet would helps you to kill your time. – Multipurpose/extended adapter would helps in case there are many devices need to be charged or powered up at the same time. Now, lets proceed with the trip report!